Geology The How Tallon Ridge: Main Limestone with underlying sandstone outcropping in the sides of Osmonds Gill (Glacial Overflow Channel). Record Name Barningham Moor. 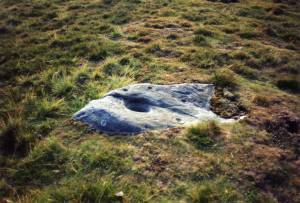 Selected rock art and associated prehistoric sites and finds. Part One: the High Moor. 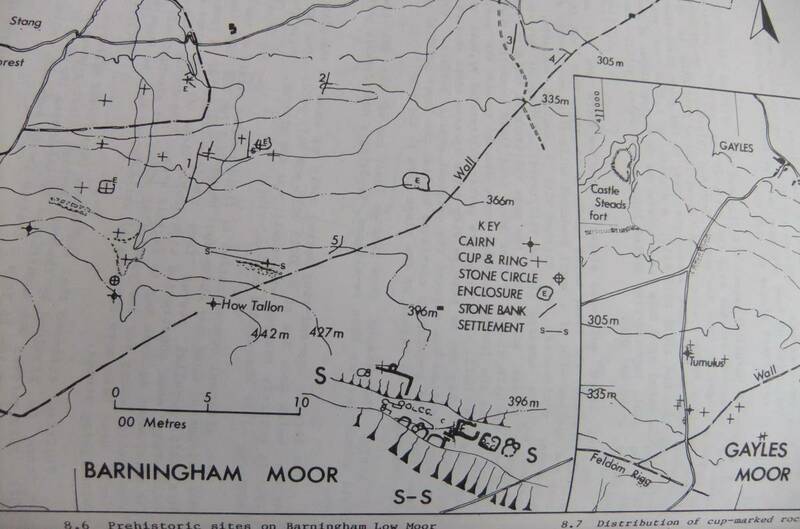 Record Description This record, Part One: The High Moor and the subsequent record: Part Two: The Low Moor will provide an overview with photographic views of Barningham Moor together with a short introductory account of a selected number of the rock art sites located on Barningham Moor. 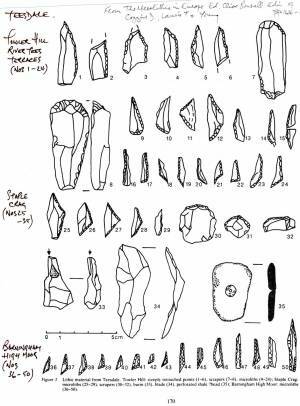 The sites and finds are illustrated with photographs taken earlier, some of these taken at or soon after their initial discovery. 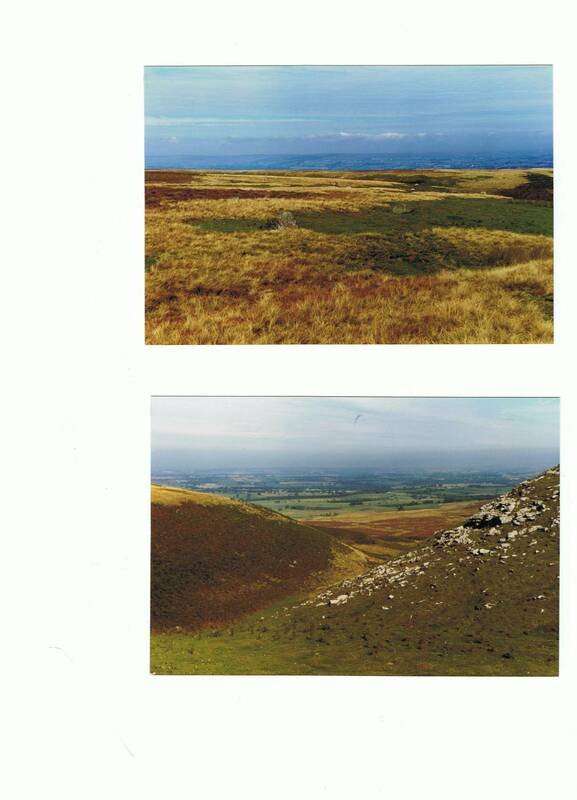 In addition, brief contextual notes will be provided of the stone ring above Osmonds Gill, the stone tumulus named How Tallon and the other less prominent Round Cairns of Late Neolithic/Early Bronze Age on How Tallon Ridge together with the burnt mounds on the Low Moor and the lithic finds from the Moor. 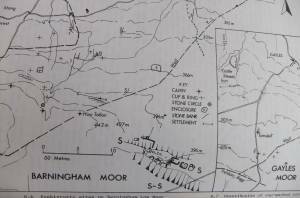 All of which which can be associated with human activity contemporary with the significant group of rock art sites on Barningham Moor. Notes 1. 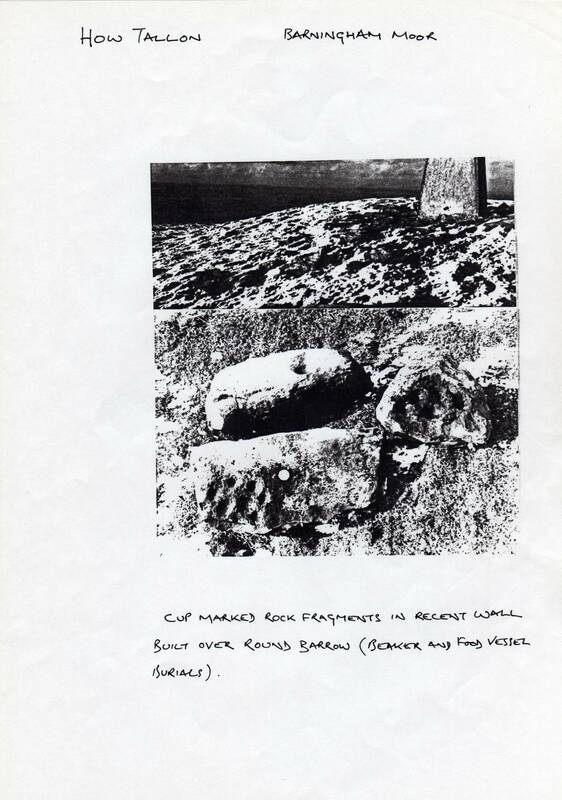 Professor Richard Bradley in the company of Stan Beckensall and myself visited Barningham Moor during the course of data collection for his book on the interpretation of prehistoric Atlantic rock art (Bradley 1997, see references below). 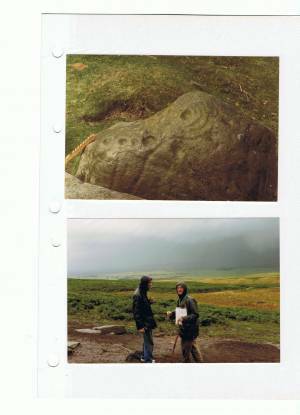 This monumental work includes (pp94,95 and plate 13) a summary of the discussions held during this visit which included walking on the High Moor Edge in a mighty downpour of rain. See photo below. 2. 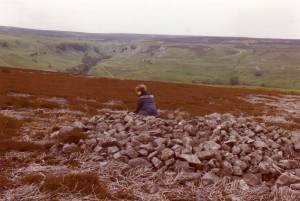 Almost all of my earlier photo images of the Barningham Moor Rock art and other sites are on slides and cannot be uploaded until scanned. The best of these images will be uploaded as soon as they can be scanned. Additional Notes References: Stan Beckensall and Tim Laurie,1998. 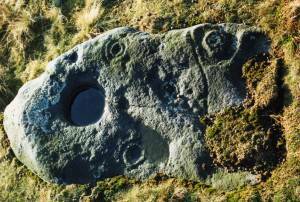 Prehistoric Rock Art of County Durham, Swaledale and Wensleydale. Durham County Books. Richard Bradley, 1992. 'Altering the Earth.' 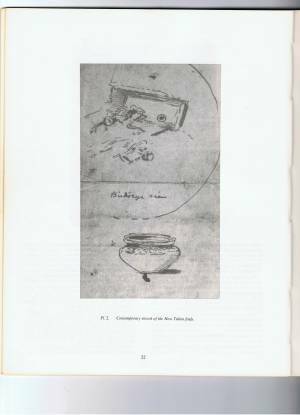 Society of Antiquaries of Scotland Monograph Series Number 8. Richard Bradley, 1997. 'Rock Art and the Prehistory of Atlantic Europe. Signing the Land.' Routledge. Richard Bradley, 1998. 'The Significance of Monuments on the shaping of human experience in Neolithic and Bronze Age Europe.' Routledge. 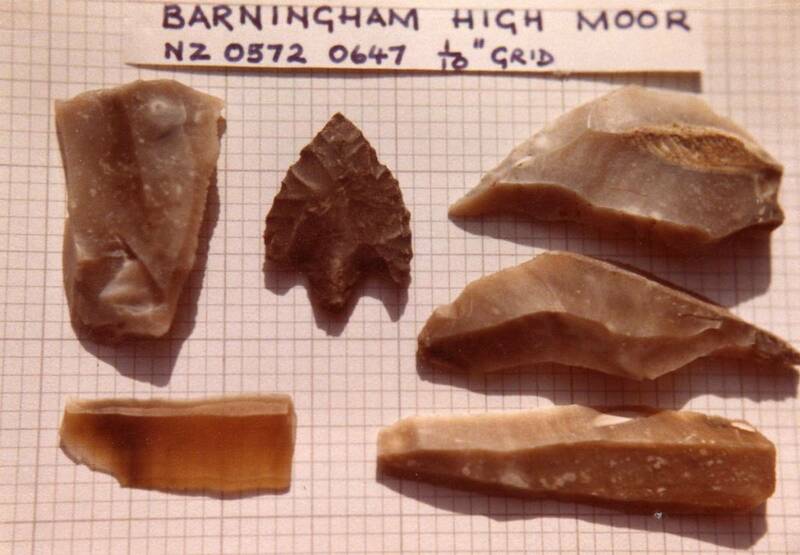 Stephen Green, Flint Arrowheads:Typology and Interpretation. 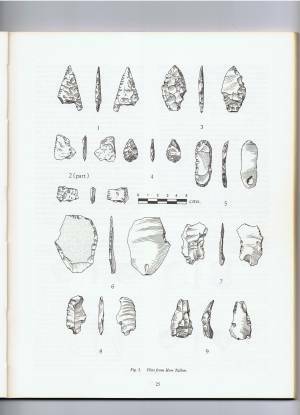 Lithics No 5. 1984. ISBN0262-7817. pp19-39. Dennis Coggins and Stephen Clews,1980. Archaeology in the Bowes Museum: The How Tallon Finds. Transactions of the Architectural and Archaeological Society of Durham. New Series. No 5. 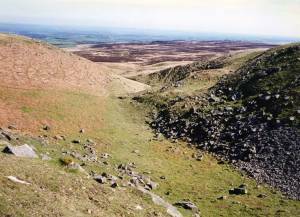 Access to the Moor. While access is possible as it is all CROW Access land. Barningham Moor is exceptionally important as a breeding area for ground nesting birds and access to search for these sites during the months of May -July inclusive is not encouraged. 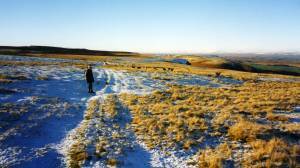 Image 2 Description The How Tallon Ridge in winter. View westward towards Osmond's Gill. Image 3 Description Eel Hill. 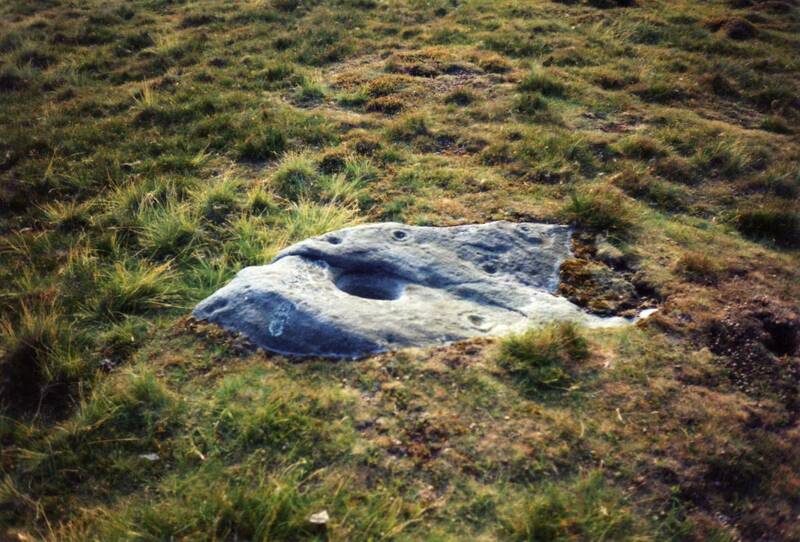 Cup and ring marked rock, Site 69, the first rock art site to be recognised on Barningham Moor. 1974. Image 5 Description Osmonds Gill. Glacial Overflow Channel with springs and Cup and Ring Marked Rock. Image 6 Description Osmonds Gill. Cup and triple concentric ring marking on slab of current bedded sandstone at base of talus slope within the Gill. 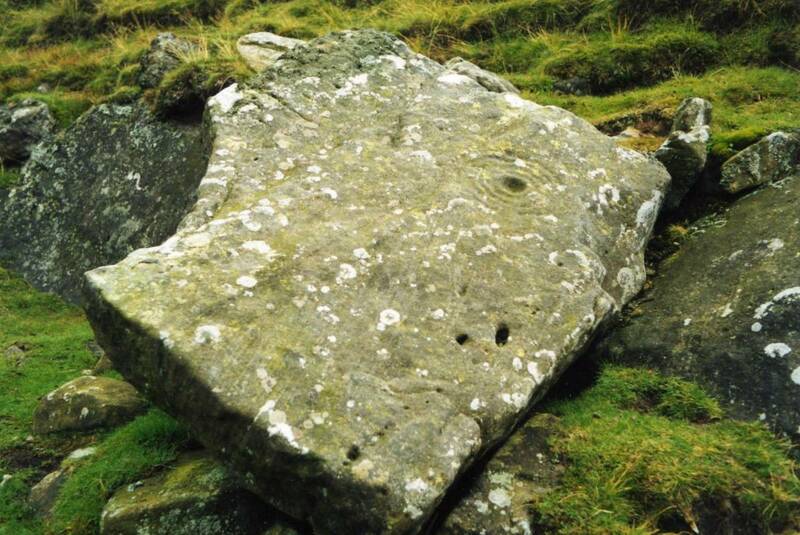 This slab is highlighted by the mid winter sun. Image 8 Description How Tallon. 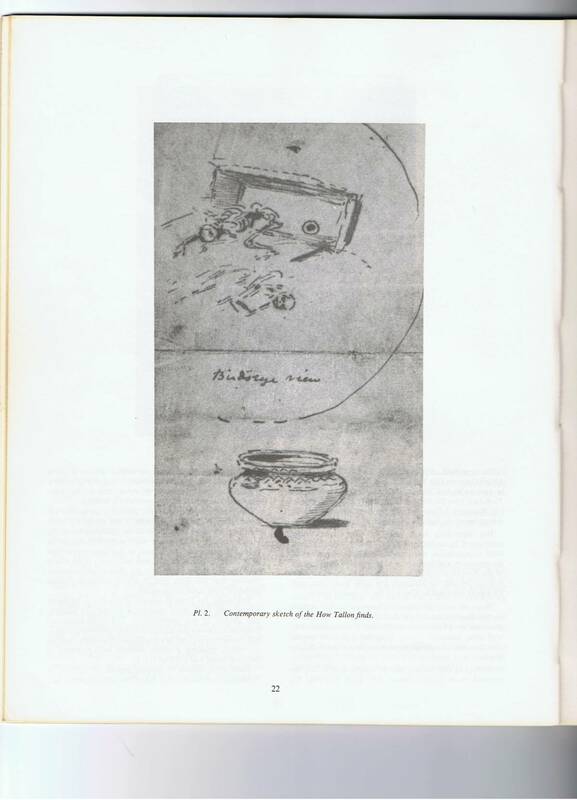 Contemporary sketch of the primary cist. Coggins, D and Clews, S. 1980. 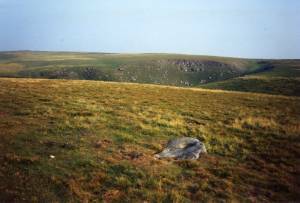 Image 9 Description How Tallon round cairn. 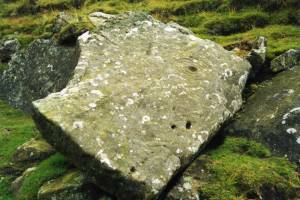 Cup marked fragment built into modern dry stone wall which overlies the cairn. 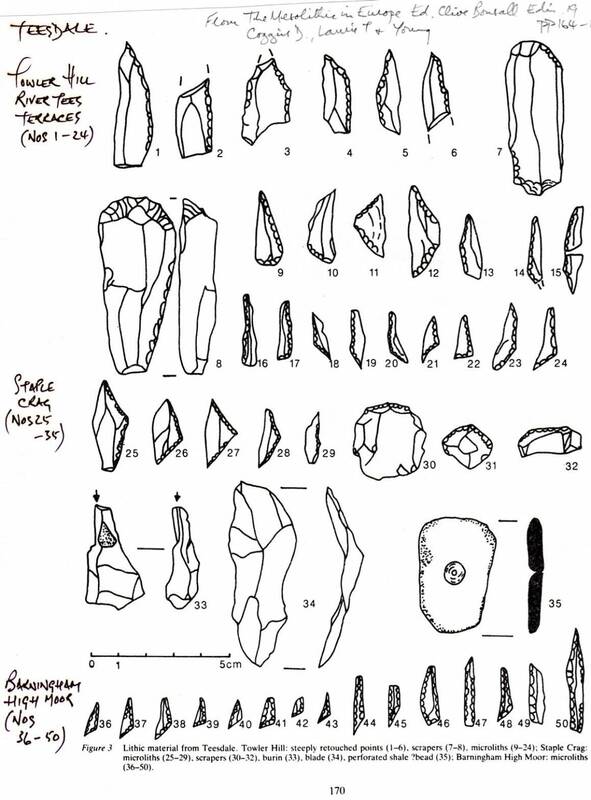 Image 10 Description Lithic finds from How Tallon. Coggins, D and Clews, S. 1980. Image 11 Description How Tallon Ridge. Eel Hill. Kite shaped arrowpoint with impact fractured tip. 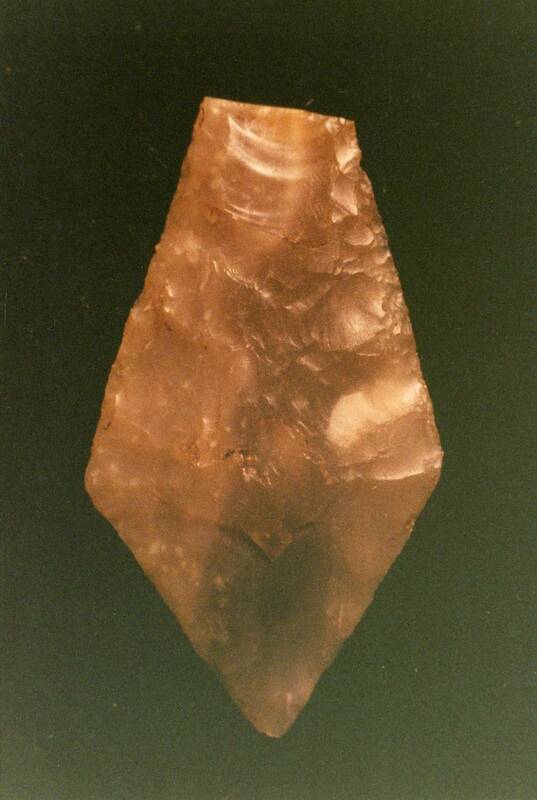 Green Type 2C, 2500-1800BC. 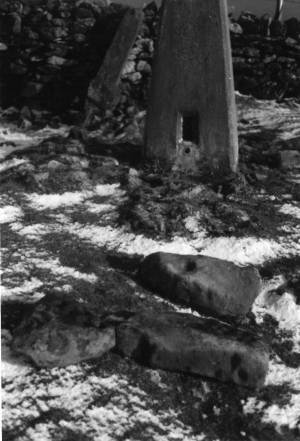 Image 12 Description Trig point on How Tallon Round Cairn with cup marked stones built into the the overlying dry stone wall. These stones have now disappeared. 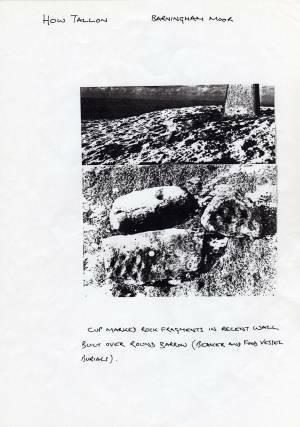 Image 13 Description How Tallon Round Cairn with cup marked stones built into the the overlying dry stone wall. 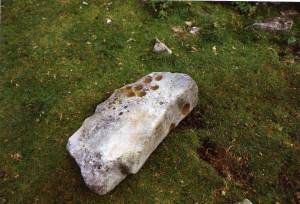 These stones have now disappeared. 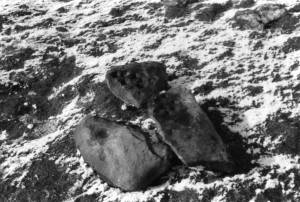 Image 14 Description How Tallon Round Cairn with cup marked stones built into the the overlying dry stone wall. These stones have now disappeared. 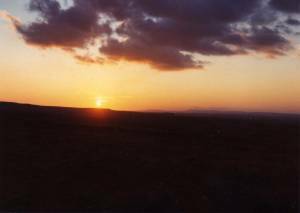 Image 15 Description Sunset over the High Moor with Mickle Fell and the Pennine Escarpment in far distance. Image 16 Description Barbed and tanged arrowpoint (Greens Type )with other lithic finds from from a microlithic (mesolithic) occupation site on the High Moor. 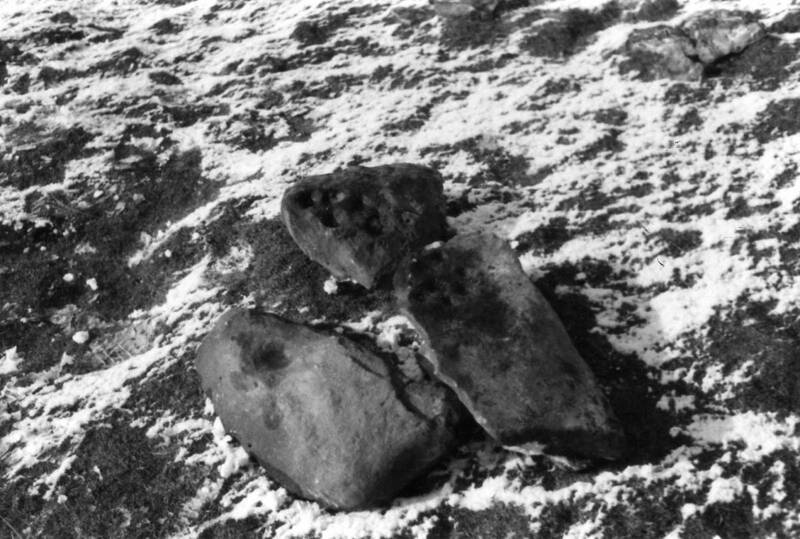 Image 17 Description Low round cairn at Frankinshaw How, the High Moor. 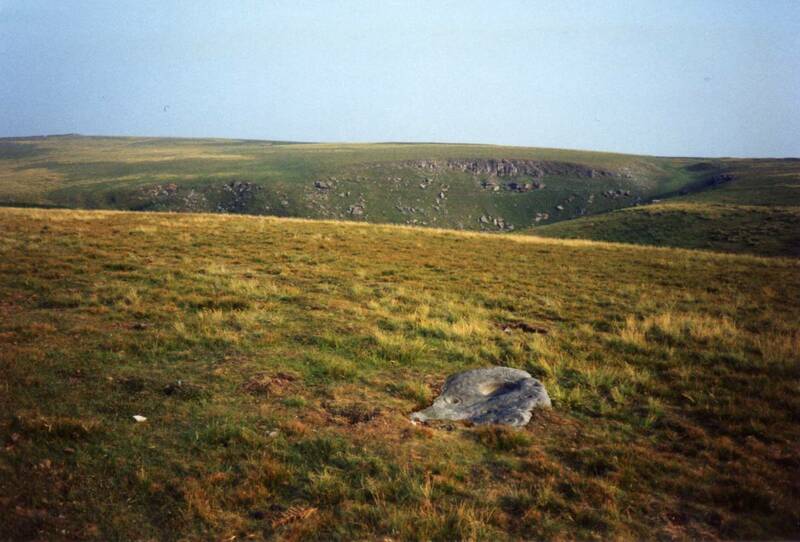 This cairn has two rocks with eroded hollows which are probably best described as doubtfully cup marked. 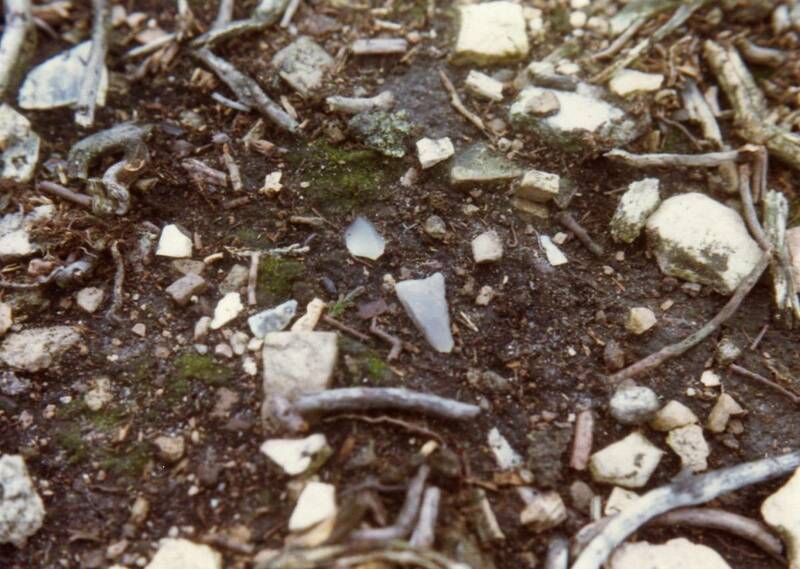 Image 18 Description Petit tranchet derivative arrowpoint, one of two from Late Mesolithic scatters on the High Moor. 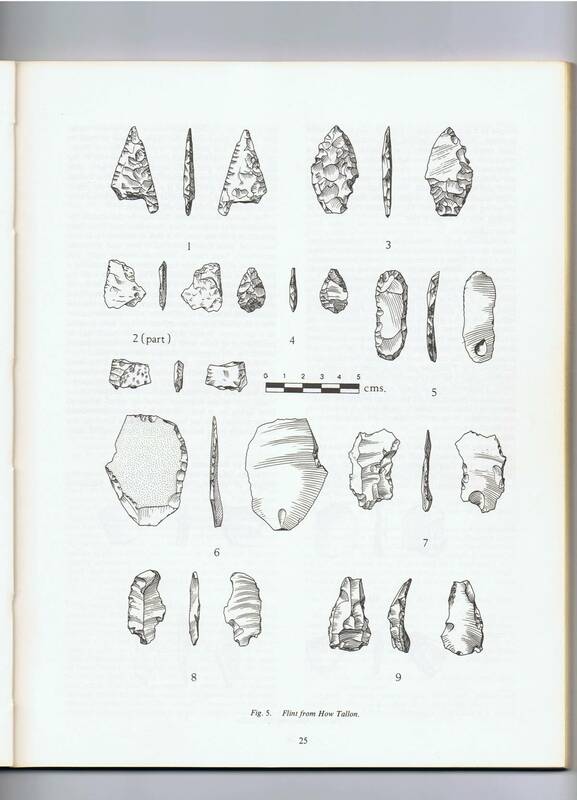 Image 19 Description Lithic finds from Teesdale Sites. Coggins, D. Laurie, T.C. and Young R. In: Bonsall, C. Ed. 1985. 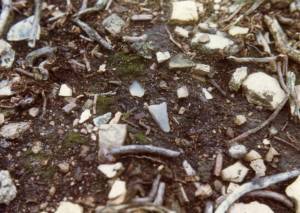 'The Mesolithic in Europe' Edinburgh. Image 20 Description The High Moor from the south. 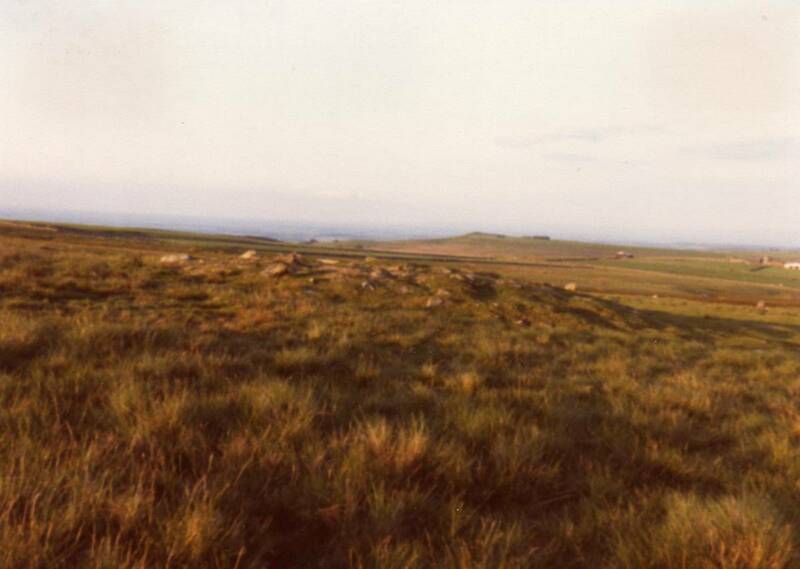 Isolated round cairn on Moresdale Ridge in foreground. Image 21 Description Upper: View northward from the Stone Ring at the head of Osmonds Gill. 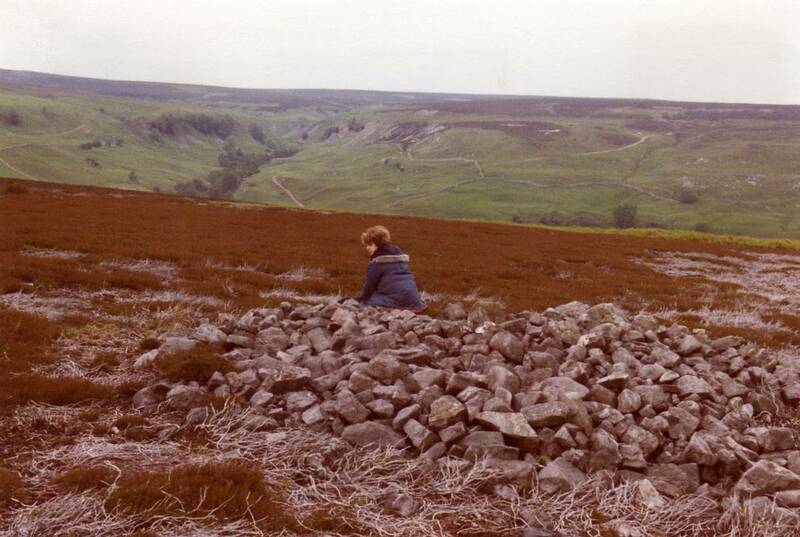 Lower: View northward across the Low Moor from Osmonds (Osmaril on OS) Gill. 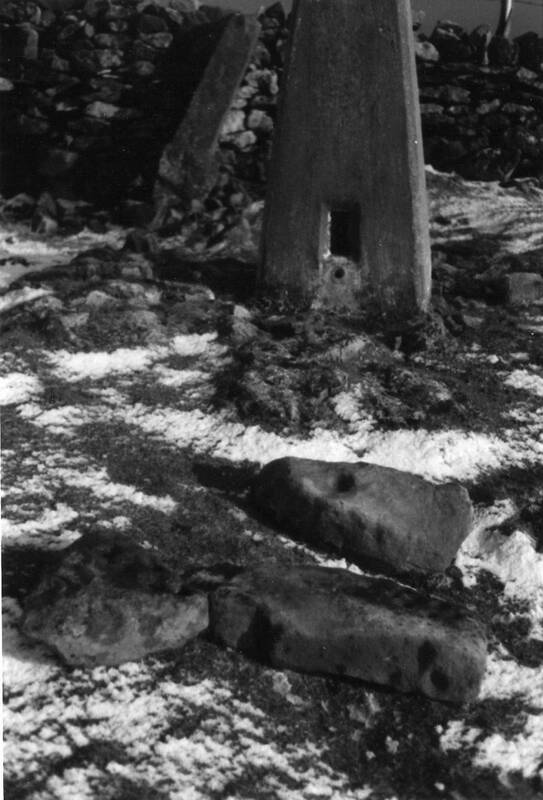 Image 22 Description Upper: Cup and ring marked standing stone at the head of Scale Knoll (Skalen How) Gill, Scale Knoll Intake. 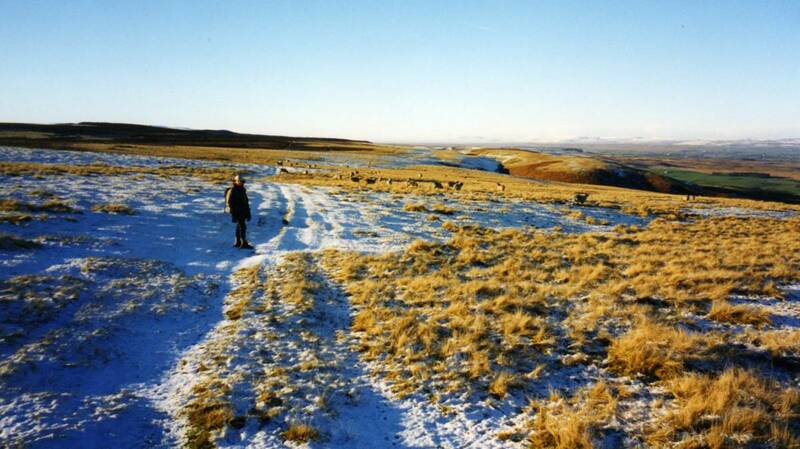 The Low Moor. Lower: Richard Bradley and TCL on the Low Moor during heavy rain. Photo Stan Beckensall.